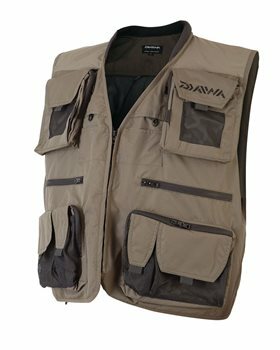 Daiwa Waistcoat is made from high quality water repellent fabric with neoprene cushion collar. It features internal vent mesh lining as well as spiral wound lanyards for easy access to accessories. There are velcro and zip pockets at both front and rear aswell as two internal zipped pockets. Innovation combined with the practical sees our waistcoats offer the ideal combination of features for all styles of angler. Whether you are fly fishing, wading or rock hopping with plugs and lures they are simply full of well considered features.